Some copies has marked with type n©b. Maybe later issues. I love Manifesto, and this 2017 vinyl pressing is the best I've heard of this album. I am very pleased with it, even if the vinyl cover is taller than all of my other records, barring the same sized one for Avalon. This was another album panned by the critics, though it did spring seven solid songs on the world, where music fans eagerly accepted the piece with open arms. Regardless, Manifesto is strange and delightful bird, with the album jacket almost distilling what was held within the grooves. This was the first album where Brian Ferry envisioned the release as more theater than not, seeming totally lost in the desperate heartache, a sense of emotional abandonment (a subject to which he instilled a great deal of emotion) and personal longing, delivering his vocals seemingly totally unaware that there were a group of first rate musicians standing behind him … and in that moment he captures a dialectic imperative, holding and balancing two concepts at the same time, where listeners freely switch from vocals to music within the same breath. If Ferry set out to encompass and capture a smoky dreamscape, he succeeded masterfully with his lush take on cinematic popular music, where Brian sets his sights on becoming the country gentleman of British rock. At the time there where many who considered all of these trappings and attitudes as being unhip, yet these aspects seemed to be just what the world was in search of at that moment, embracing their uptown dinner guest and his splendid musical entourage as nothing but sleek and cool. Yes, Thompson’s drumming had been severely toned down, less aggressive where both the chords and playing of Manzanera’s guitar, leaving Ferry to croon like someone lost to time, an emancipated Norma Desmond if you will, infatuated with his own sense of being. Manifesto is an artistic vision brought to light, and to see it in any other fashion would be to do it an injustice. *** The Fun Facts: There’s a picture disc vinyl of this album where the models featured on the jacket are unclothed. Both the album’s title and typography were inspired by Wyndham Lewis’ magazine Blast. I think of Roxy Music in two stages. Their first five albums are to me, the complete circle of that band. After those five albums, the band kind of broke-up to focus on solo music. Ferry at that time was still doing albums that were half original and the other half covers. "In Your Mind" was the only Ferry album at that time where it was all original songs, written by Bryan. Still, the truth is even the covers he did was a personal or even original statement by Ferry. A cover is a cover unless it was done by Bryan Ferry and then it means something else. 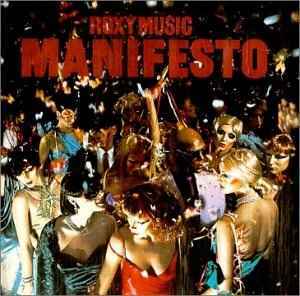 "Manifesto" was the first Roxy Music album after they split up. There's a four-year wait between "Siren" and "Manifesto." There was a lot of activity in those four years by Ferry and company away from the Roxy Music world. What's interesting about this 'good' album is that it has nothing more to say. "Manifesto" is more about the craft of good songwriting and recording than inspiration. Emotionally, the songs sound post-depression has taken place. It's interesting that this once radical band puts out an album in 1979, where there was a great landscape for the post-punk music world. The title song "Manifesto" touches on that era music-wise but lyrically is rather dry. I said, "It's love", you said, "Alright"
You're dressed to kill and guess who's dying"
So me and you, just we two got to search for something new"
my version has white labels with back-to-front texts in very light gray. strange... anyone else seen this before?! Matrix No. is 2344 129 S2 = 2 32 0. It does not have "Strawberry" etched. Includes the single version of 'Dance Away' instead of the original album version. At first listen, I can see why this album might not be a fan favorite. However, the production quality is superb. This album just sounds excellent! The cover is perfect for this album, for each song on the "west side" would play out fine at a party without complaint from anyone, with "Dance Away" being the single you're probably after. "East side" is more daring, much less accessible, but intriguing and without which Roxy Music wouldn't be Roxy Music. Bryan Ferry is at the top of his vocal game, and his crooning takes center stage. This album serves you two cocktails, one to perk you up and the other to seduce you. It worked on me, I took it home.